Smart's Fun Familia once again treated us with free tickets to Enchanted Kingdom! I took this opportunity to get the name of EK's mascot which I already knew before but have already forgotten. His name is Eldar and his face can be seen in almost all the gift shop items inside the park. Eldar, in Hebrew, means "god resides", while in Norse, means "warrior who fights with fire". 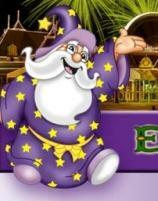 I have no idea why EK chose this name for their mascot.